Unfortunately though, despite RGCD actually previewing the game twice over a period of two years, it was never really finished. 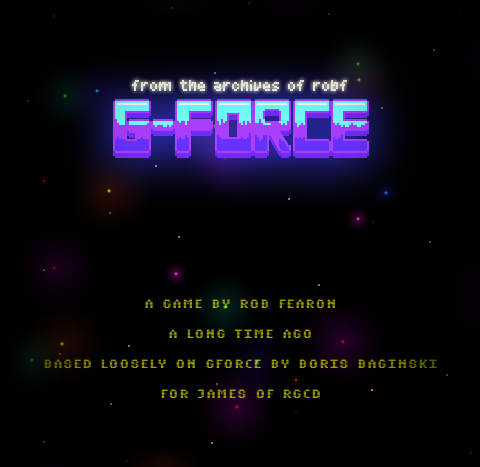 In fact, the game became something of a joke between RGCD and Rob, with me personally nagging him after every game release to get back to work on G-Force. In return, Rob regularly teased us with concept art, and even at one stage an amazing 3D tunnel effect for a frontend that never actually made it into the game. 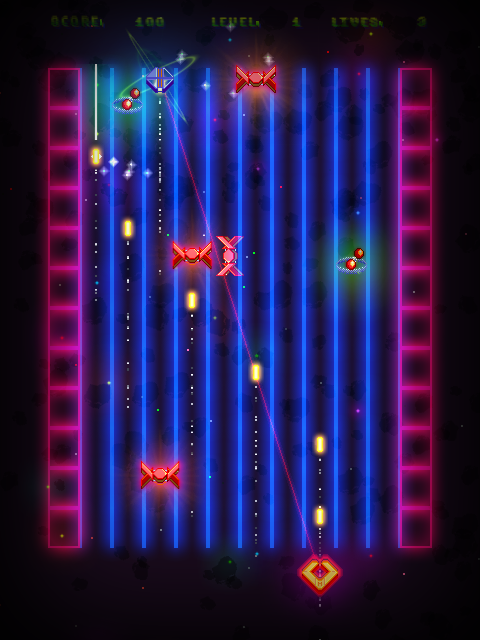 As the game evolved, G-Force seemed to become more and more of a testing ground for Rob to experiment with the neon glowy explosions and lasers in-your-face effects that his work would later become reknown for. So here we are, 2013, some six or so years after the original unveiling of G-Force on the long-lost original retro-remakes forum, and following one of my regular twitter 'is it done yet?' requests Oddbob has tidied up and packaged a 20-level build of the game in GM Studio and set it free into the wild. And what do you know? It even has RGCD mentioned on the title screen. Thanks Rob! With the original Tempest 2000 remaining a timeless classic, it is relatively unsurprising that G-Force has aged well. 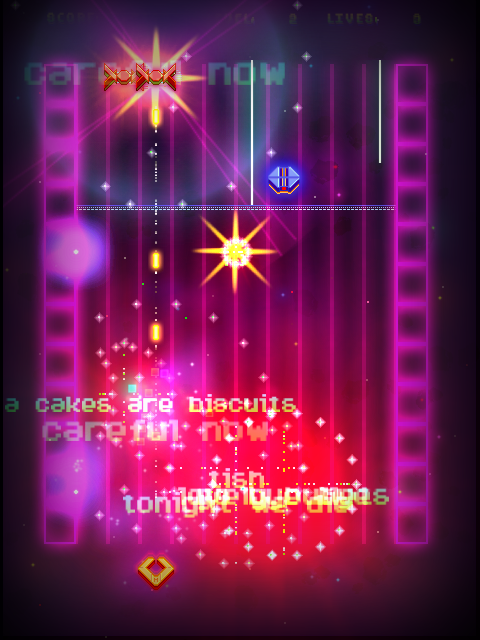 The action is fast and frantic, with your 'claw' at the bottom of the screen facing wave after wave of aggressive and abstract enemies whilst the player is bombarded with nonsense messages and visual feedback. Your goal is to simply prevent the enemies from reaching the base of a series of columns - if the buggers reach the bottom then (much like Tempest 2000) you can time your movements so that you niftily jump underneath them as they step from column to column, but ideally you want to vaporise them before that situation arises. Luckily, as well as your regular death-ray you possess a single-use zapper that clears the screen of baddies. It doesn't clear the 'spikes' that slowly advance down the screen though, which means it is still possible to impale yourself as you zoom to the next stage after completing the current wave. G-Force isn't all just mindless blasting; some strategy and forward planning is required. And that is pretty much it. 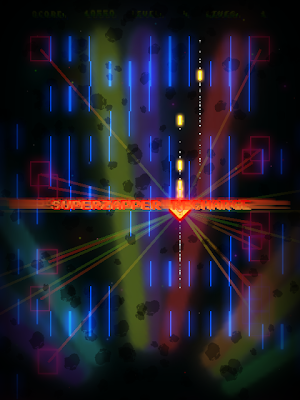 20 levels of insane single-screen shmup mayhem with gameplay mechanics borrowed wholesale from Llamasoft's 64-Bit opus, backed by a minimal tech soundtrack and featuring a completely bonkers narrative. Has it been worth the six year wait? For the most part, probably not. But for people like me, who've been following Rob's work since he first cut his teeth with GameMaker, it's a really fascinating little game; a piece of quintessentially British indie-gaming history from one of the scene's forefathers. This game is awesome. Any chance we can get mouse support so I can play with my usb spinner?